Seventy years ago today, a nineteen-year-old ammunition carrier from Sylvania, Ohio, saved a man’s life. He made himself a human shield, protecting his friend as shells rained down. He survived four hours on Iwo Jima. His Silver Star award was posthumous. Many days later, a twenty-four-year-old mortarman from Port Arthur, Texas, picked up a rifle and joined a listening post. He was hit by a grenade, held on all night, and cried for his mother before he died. He survived Guadalcanal and twenty-six days on Iwo Jima. His only distinction was to be the battalion’s last combat casualty. Between PFC Howard Pratt and PFC Willie Cordon were 138 other deaths. Some were old veterans, in their late teens or early twenties, veterans of three previous campaigns or more. Some were much newer, and their first battle would also be their last. And some arrived in the morning and were dead by afternoon, their time on the line so short that nobody wrote their names on any muster roll, their contribution to the war reduced to an anecdote in a veteran’s story, their faces associated with terrible memories of how they died. Add to their number nearly 500 men who never saw again, walked again, or slept through the night again. Dozens who still carry pieces of shrapnel in aging bodies but received no recognition. The handful whose memories gave them no mercy, who lived out their natural lives in asylums and hospitals, who engineered their peace with a bottle in their hand or a gun to their temple. Those who simply stopped talking when it was over and never spoke of it again. 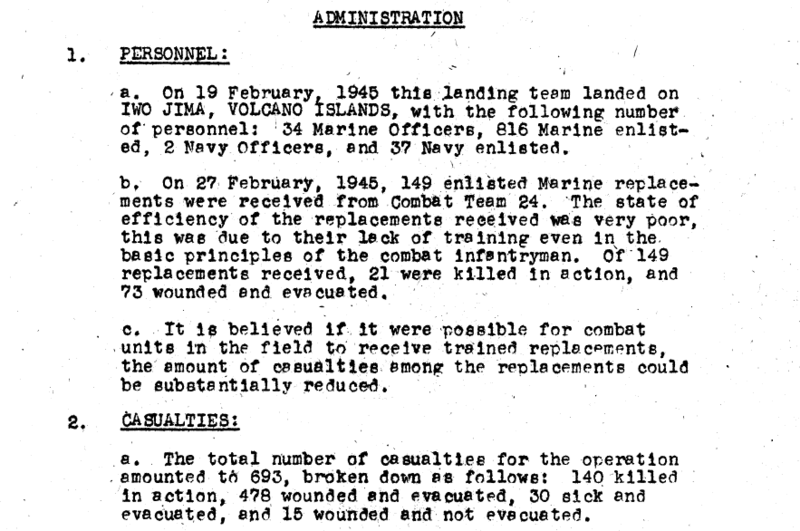 Those who fought with First Battalion, 24th Marines are only a small part of the Marine legacy. Their story took place not in the famous first wave, or on the slopes of Suribachi. They worked the long slog through locations whose names are either starkly descriptive (Boat Basin, The Quarry, Hill 382) or brutally evocative (The Meat Grinder, Amphitheater, Turkey Knob). They saw the flag go up through binoculars. They thought it signaled victory too soon. Eleven of the 140 died on the day of the flag raising. They came from all walks of life, all areas of the country, and the oldest of all was a relic at thirty-six. Four men turned eighteen during the battle. One turned seventeen. One was rumored to be only fifteen, but died before the truth came out. The roles they played in the final victory ranged from the heroic to the minor, but all contributed, and all should be remembered. The battles of the Pacific were far and above anything even the brass could imagine. The men in this theater of operations found they had to write their own manual, there had never been a war like that before.